The stance is critical for recurve success. Aiming and shooting a recurve bow requires regular practice and proper execution of fundamental techniques. Poor technique is evident through inconsistent shooting, stray arrows and backlash from the bowstring. Aiming the recurve bow is a process of alignment that begins with the stance and ends with release. The process requires focus and a willingness to overcome any initial mistakes in the shooting process. The stance is an important aspect of aiming the recurve bow. Your stance must be comfortable and it must accommodate your sight down the arrow shaft and into the target. Assume a stance with your feet shoulder width apart and perpendicular to the target. You may stagger your feet slightly as long as it is consistent with each shot. Keep your back straight and turn your head toward the target. Your vision must be aligned with your straightened arm that grips the bow. Keep your head vertical while aiming and do not turn your body to adjust your vision. The grip must be properly used while aiming the recurve bow. Do not grip the bow handle tightly because it will restrict follow through and affect the backlash of the string. Place the grip in the crease between your thumb and forefinger. Apply the majority of the pressure to the crease and softly close your hand around the remainder of the grip. Grip the bow string with one finger above the arrow nock and two fingers below the arrow nock. Hold the string in the first crease below your finger tips and release all of the fingers simultaneously for an accurate shot. Draw the bowstring by pushing the grip to straighten your arm, then pulling the string back to your anchor point. 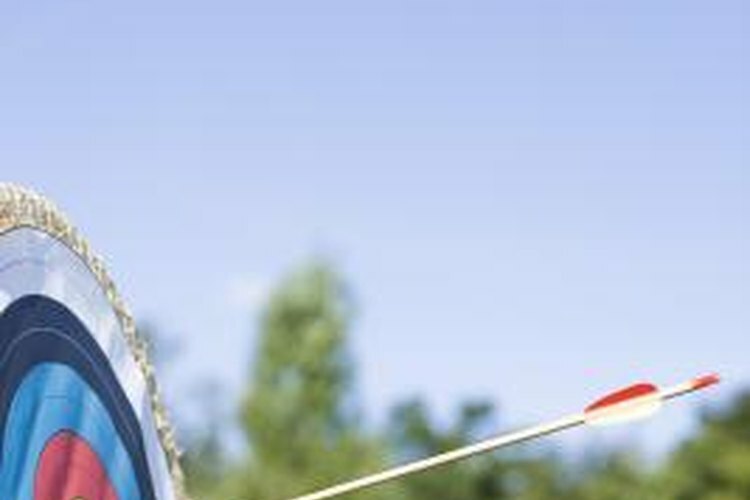 The motion is smooth and consistent with experienced archers, and changing the motion is liable to change your stance and reduce shooting consistency. The anchor point also must be consistent. The point is not the same on every individual, but the chin and jaw are the most common. Hold your fingers against the exact same point every time for a consistent and accurate shot. Hold the bow in a drawn position and focus down the arrow shaft and past the point of the arrow. Adjust the level of the arrow to meet the target. Aim high for long shots and at the exact target for close shots. Exhale when you are prepared to shoot and steady the aim in the desired position. Push all three fingers forward and slide your hand back across the side of your face to allow an even arrow release. After the arrow is released, allow the bow to fall forward and follow through with the shot.